Updated Wednesday May 10, 2017 by Ted Phalon. 2017 will be our fifth year of hosting travel baseball tournaments. From a single 12 team tournament in 2013, we expanded to 5 agee groups and 46 teams in 2014, to over 100 teams in both 2015 and 2016 We hope to continue this trend in 2017 in what has become one of the premier tournaments in Western New York. In addition to the games, players will also have the opportunity to compete in Skills Competitions such as a HR Derby and Around the Bases. Many of our tournaments also feature night games for all age groups under our newly installed lights. 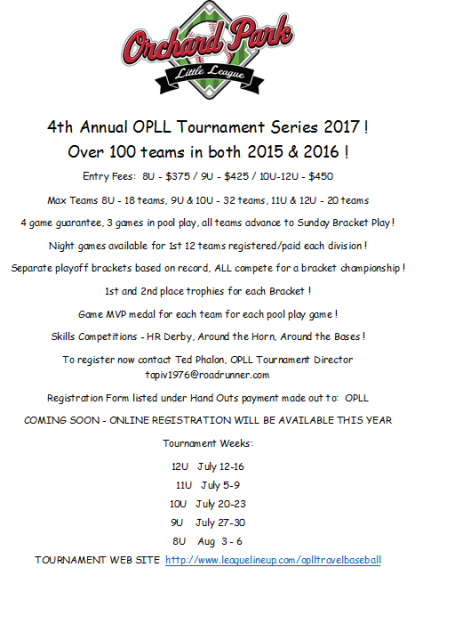 For more information about any OPLL Sponsored tournaments, contact our Tournament Director.